You've got to take care of your set up! It's the key to being able to make the most out of your juices and finding that satisfaction that you've been looking for. When you're in the mood to vape, you want to fire up your mod as quickly as can be without having to fuss around with a build that's refusing to cooperate. Having a kit like this one around with all of the different tools that you need to keep your build in tip top shape and able to run just as smoothly as ever. With 35 different pieces included, you are going to be getting quite the package that is going to make sure that you are confident that you will be able to take on absolutely anything that comes your way. 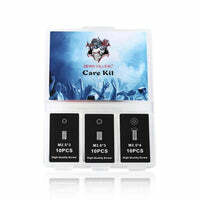 Any vapers who really focus on their setups and love to customize will think that this kit is a necessity that they would advise any of their friends to go out and pick up as well. No one ever regrets being prepared and the peace of mind that it brings will change your whole life. Demon Killer is a brand that is really well known and respected for their products that make customizing your setups just as easy as can be. They really have brought a lot of affordable, high-quality solutions to the vaping community that are game changers at the absolute finest. Three screws are available for all atomizers on the market. Equipped with a soft brush for easy cleaning atomizer.